Happy Monday! Temperatures have finally cooled a bit in Southern California - like 20 degrees cooler. No more 100 degree fall weather! Big YAY!!! I am so ready for permanent fall weather. Now that I got that off my mind, I'd like to share a little bit of recent progress that we've made in our boys' bedroom. As you may or may not know, we purchased a fixer in May 2013, and have since been slowly updating the house. 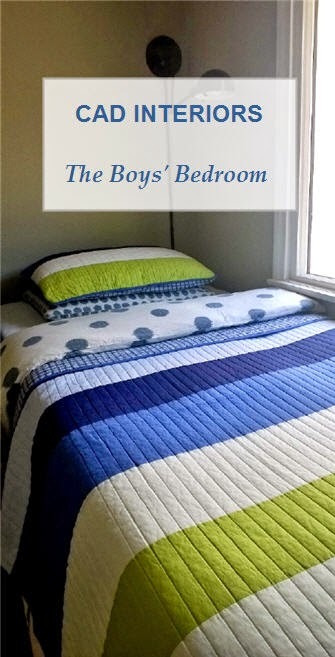 One of the spaces that we renovated before we moved in was our boys' shared bedroom. A year later, I finally started to tackle the design and decor of the space. If we're lucky, the room should be "done" (rooms always evolve under my watch) before the kids are off to college! Here are some pics of the new additions to the room. 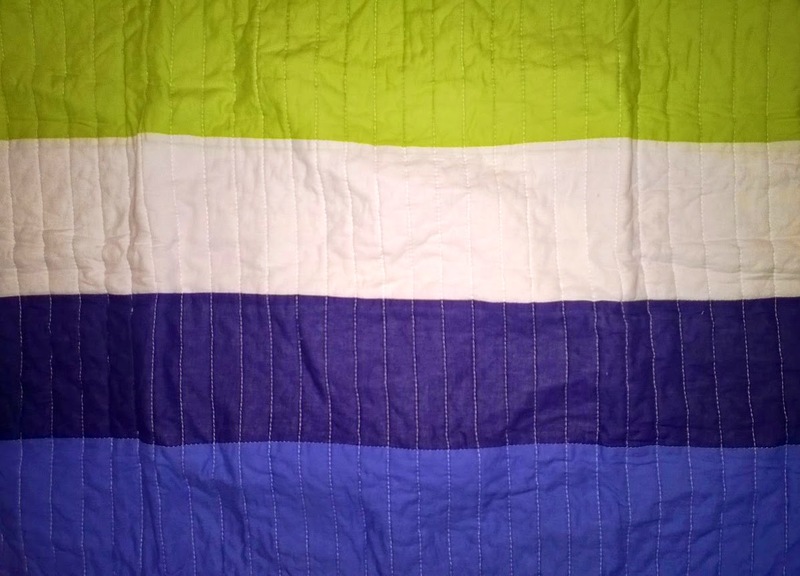 Remember the bedding my kids approved awhile back?! Well, here it is, laid out on the beds! Pretty and practical. 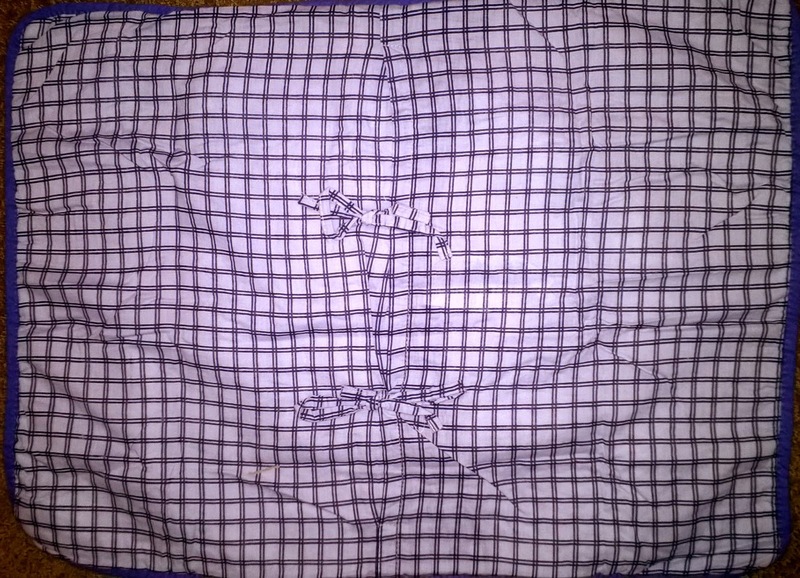 The new bedding has a quilted texture and is quite soft. I layered it above their existing duvet sets. It added so much color, texture, and pattern to the room - not to mention softness, depth, and dimension. 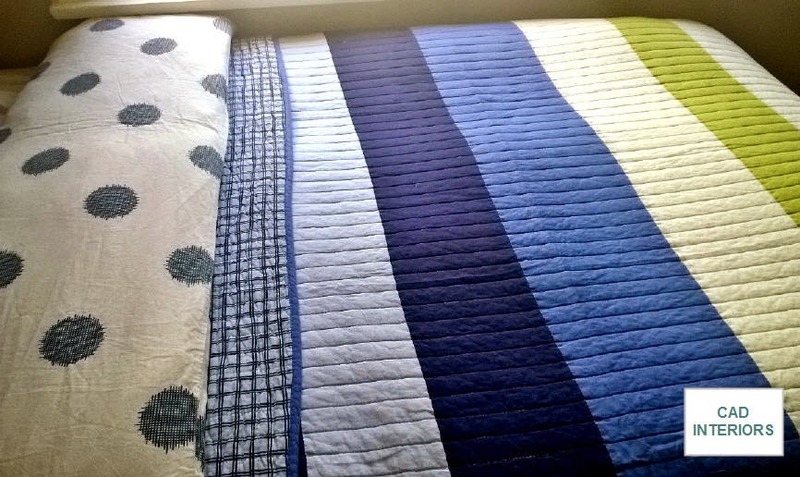 I'm a big fan of layered bedding. It gives you the option to peel back layers or add warmth as needed. It also allows you to introduce texture, pattern, color, etc. 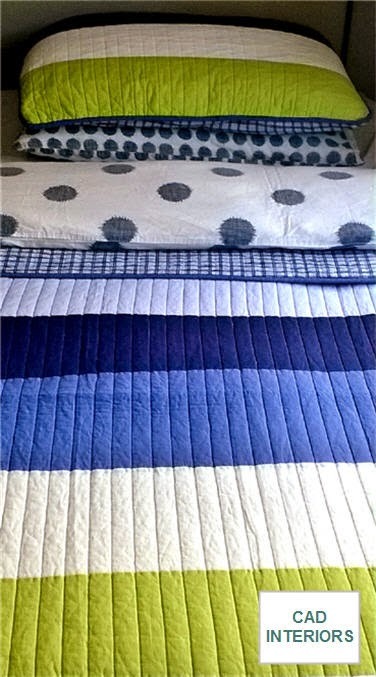 The wide colorful stripes, checkered reverse side, and rough "polka dot" patterns in the boys' bedding all blend together since there is a common blue color that ties the different linens. I love to mix and coordinate patterns in my designs. My handy hubby also installed adjustable task lighting above each of the boys' beds. Both of my kids read a lot, especially in the late afternoon and before bedtime. 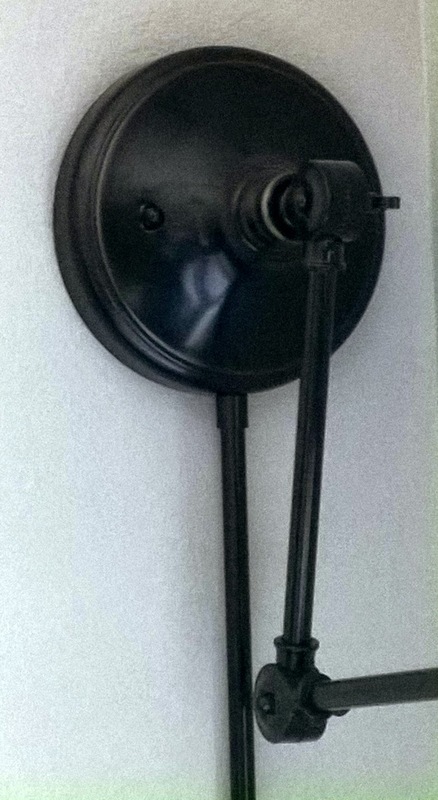 These wall sconces are one of the most functional items in the room. The boys love having their own personal lamps. The sconces add warmth and casts great light. They have an antique bronze finish that coordinates with the finish of the ceiling fan in the room. 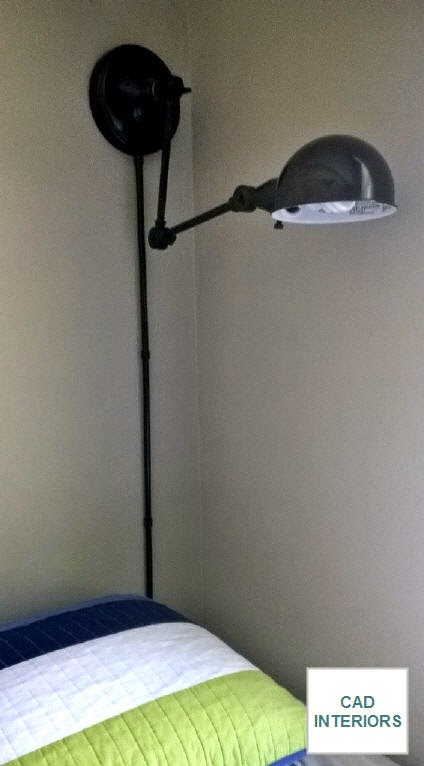 Although I really wanted task lighting that would fold "flat" against the wall when not in use, the price point of this sconce was just too good to pass up...$33/each! I had originally sourced two similar options that were quadruple the cost. We can live with the extended swing arm! Kickin' it back into gear in the boys' bedroom!